The determination of a 16-year-old boy to share in his nation’s World War I military responsibilities, despite the Army’s minimum age requirement, is reflected today in a strong and still growing Birmingham steel fabricating company. In 1919, after the conclusion of World War I, Walter J. Hanna, who was still two years underage, was accepted as an enlistee in the Alabama National Guard by fabricating his birth date. He was picked as the best-drilled soldier in the Alabama Guard and was promoted to second lieutenant before he was 21 years old. In 1921, he won the Southern Amateur junior lightweight boxing championship, weighing in at 128 pounds. He also set a state record for the offhand rapid-fire marksmanship, hitting 98 out of 100 with the rifle. He won many marksmanship trophies and moved up to captain in the Guard. He earned the nickname “Crack” for being an expert marksman. He was “the soldier’s soldier,” because, as he said, I never asked a soldier to do anything I couldn’t do and didn’t do.” At Camp Blanding, Florida, he was put in charge of marksmanship and bayonet training. He laid out a 100-yard obstacle course for bayonet training. At 39 years old, he broke the world’s record, running the course in 28 seconds. World War II marked a critical period in the military career of Crack Hanna. He was made a lieutenant colonel and put in charge of training for a regiment in the 31st Division. The division headed for the South Pacific, and he became a regimental commander, a bird colonel. He planned and executed a successful invasion of Morotai, an island in the Netherlands East Indies. Japanese bombers came over one night, and while he was running for the shelter a bomb went off nearby and slammed him up against the logs. His neck was broken, some teeth knocked out, and three vertebrae were broken. Later, at Mindinao in the Philippines, his regimental combat team marched across the island in the rainy season. It was one of the worst experiences of his life, he remembers, “I lost 44 pounds from 184 to 140. It was hot, and I got tired of digging a trench and laying in that water. And if you stuck your head up, you got it shot off. And at night, it was cold. I was never so hot, so hungry or so cold.” By the termination of the war he held the rank of brigadier general, an assistant division commander, a tribute to his capability as a battlefront leader in the Southwest Pacific. Hanna returned to active duty in the Korean War as an assistant division commander. A heated disagreement with the division commander over what Hanna regarded as inadequate training methods led to the opportunity of his assuming responsibility as Alabama adjutant general under Governor Gordon Persons and his involvement in some of the most dramatic law enforcement episodes in Alabama history, the Phenix City cleanup. Phenix City was a lawless place during the 1950’s, rife with prostitution, corruption and gambling. Local law enforcement was in on it, according to the book. The Tragedy and Triumph of Phenix City, Alabama by Margaret Anne Barnes. Phenix City exploded into the national consciousness, however, in June 1954. That’s when someone there murdered Attorney General-elect Albert Patterson just before he appeared before a grand jury hearing allegations of voter fraud in Russell County. Gov. Gordon Persons declared martial law and tapped Maj. General Walter “Crack” Hanna, head of the Alabama National Guard, to clean up Phenix City. As commanding officer of the Guard, General Hanna was, in effect, commanding officer of the town of Phenix City for more than six months. Crack Hanna and his men gathered enough evidence to shut down Russell County’s criminal organization and put the masterminds in jail. During the clean-up Guardsmen ran the courthouse and the city hall, finally turning the city back over to civilians in 1955. While General Hanna was clearly in charge of the mission in Phenix City, accompanying him was a young PFC named Pete who also happened to be the General’s son. The lessons Pete learned in Phenix City as well as those he experienced working at Hanna Steel since he was 12, would shape the long term future and values of Hanna Steel. General Hanna retired from the Alabama National Guard in 1963. His awards include Silver Star, Legion of Merit, Combat Infantryman’s Badge, Bronze Star, and many more. General Hanna died in 1988. Prior to World War II, General Hanna created a sales agency called Hanna & Co. When he returned to Birmingham after the war, he launched a business manufacturing highway signs and signs cautioning safety in plants and industrial operations. The business flourished and soon it became the largest manufacturer of traffic and safety signs in the south. Meanwhile, Hanna saw new opportunities in the steel-processing field. In 1954, a new business was launched under Hanna’s leadership, a plant and warehouse specializing in carbon sheet steel and strip products processed to the buyer’s requirements. On Monday, May 20, 1963, General and Mrs. Hanna walked to a speaker’s platform on a red carpet of steel for the ground breaking ceremony for the present location of Hanna’s Fairfield plant. The City of Fairfield had established a 43-acre industrial park, of which 7 acres belonged to Hanna Steel. The park was bounded on the west by four railroad lines; on the east by the then proposed Interstate 59; and on the north by the Wylam overpass, a direct route from Birmingham to Birmingport and deep water transportation routes. The new 100,000 sq. ft. structure was open for business October 1, 1963. The company had grown to six times its original size since its’ founding a decade before. Only two years later a 25,000 sq. ft. addition was built. General Hanna was always deeply involved in all aspects of life at Hanna Steel Corporation, from helping an individual employee with a personal problem to major management decisions. Pete Hanna bought his first batch of Hanna Steel stock from his father in 1962 with an $80,000 loan he got from what was then SouthTrust Bank. Shortly thereafter, Pete began making his mark, taking responsibility for much of the growing company’s operational and personnel matters. But Pete had big dreams. In the early 1970s he pushed his father to bring Hanna’s transportation in-house. To this day, Hanna owns its own truck line. Then, the 1970s oil crisis sent dozens of counterparts scrambling into the oil pipeline business. Hanna stayed put, however, and found the construction tube market left virtually bereft of competition. The Company seized the opportunity and began its tubing operations. In 1983, the world’s first “wide” (54”) induction curing coil-coating line to produce pre-coated steel for prefabricated buildings was installed at the Fairfield plant. In 1984, the General had an announcement to make. Given the chance to meet the offer, Pete once again scrambled to SouthTrust Bank. With his previous equity in the company, he could buy the General out for about $10 million. He did, and in 1984, Pete Hanna could look at his father’s company and call it his own. In 1991, Hanna opened a 144,000 sq. ft. Tuscaloosa tubing facility which it expanded in 1995 to 460,000 sq. ft. Today, the 500,000 sq. ft. site is the Alabama home for Hanna’s southeast tubing operations. The company expanded again in 1999, opening a new 250,000 square-foot plant in Pekin, Illinois. The coil coating operation has a line capacity of 300,000 tons and the ability to coat coils from 24 inches to 62 inches wide and steel gauges ranging from .020 to .189. The company also has two tube mills located at the facility giving it better access to key Mid-western markets. 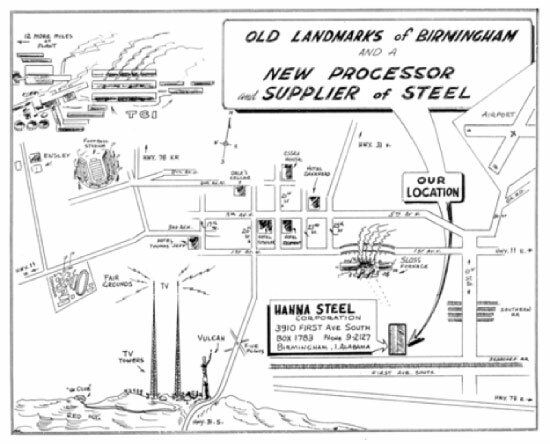 Today, Hanna Steel Corporation is still a privately held company with corporate headquarters in Hoover, Alabama. It operates coil-coating facilities located in Fairfield, Alabama, and Pekin, Illinois. Hanna’s southeastern tubing operations are based in Tuscaloosa, Alabama and its Midwestern tubing facilities are in Pekin, Illinois. Hanna Truck Line, known as HTL, rounds out the Hanna group providing consistent deliveries to our customers. Hanna's Pekin, Illinois facility is conveniently located between Chicago and Saint Louis.